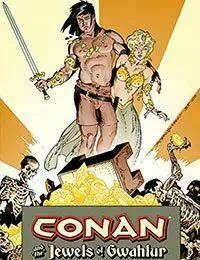 P. Craig Russell, the artist best known for adapting literary works to comics, applies his legendary talents to Conan in this adaptation of Robert E. Howards The Jewels of Gwahlur, one of Conans last adventures before becoming king. A young woman, having made a string of bad choices, finds herself the pawn of mercenaries-one of which is Conan of Cimmeria. As the former dancing girl poses as the dead oracle of a primitive cult, Conan puts his experience as a thief and a soldier together in pursuit of some of the most prized jewels in the world-the Teeth of Gwahlur! Featuring a sixteen-page sketchbook and an interview with Russell covering his career and creative process on this book, this handsome book not only highlights one of fantasy arts greatest living talents, it shows once again that Howards original Conan tales remain unsurpassed.